Say "You're an angel" to each of your guests with these angel bookmark favors! One of Christianity's true icons, this little angel is ready and able to share in the spirit of your - and your guests' - day! And your family and friends are sure to pause and count their blessings each time they see this special favor marking the page of their book or Bible. 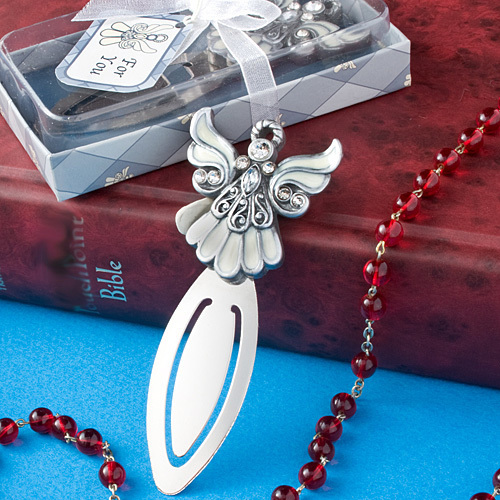 Each angel bookmark measures 3.25" x 1.375" and features a dramatic pewter colored poly resin angel with inlaid white enamel, enhanced with carved detail and multiple glistening rhinestones. The angel charm is perched on top of a sturdy silver metal page clip. An elegant addition to any religious occasion, each comes in a decorative clear topped box with a two tone silver base with a diamond pattern and angel design, tied with a white organza ribbon and an attached matching design "For You" tag.time from NY.